BVECCS after hours vet clinic on Brisbane’s northside provides a 24 hour emergency service on the weekend and through the night during the week. We are always fully staffed and fully equipped, ready for any pet emergency. Our dedicated vets are highly experienced with BVECCS known for providing the best veterinary emergency service. Specific services that we provide at our Albany Creek hospital are listed below. • 24 Hours on the weekend, 6pm to 8am Monday to Friday nights. 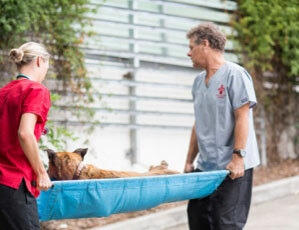 Brisbane Veterinary Emergency and Critical Care Service is a veterinary hospital providing an emergency care service. We are staffed with experienced vets and nurses who all work together to help you and your pet through this difficult situation. From their Albany Creek hospital, BVECCS provide their critical care service throughout the North Brisbane area and up to the Sunshine Coast. There is no appointment system and cases are seen according to their level of urgency. We recommend that you call ahead to notify our emergency team that you are coming. If you do so, then we can be as prepared as possible for the arrival of your injured or unwell pet. We can also provide you with some advice as to what you can do for your pet immediately before leaving home. No matter the size of the patient or their clinical problem, we keep their families updated about the treatment options and recommendations so you know the status of your pet’s health at all times. Our vets and nurses closely monitor our patients in our ‘state of the art’ emergency care centre. When your pet might be ready to return home or be transferred to the ongoing care of your usual veterinarian closer to home, a full medical record is sent to your pet’s regular veterinarian to ensure there is continuity of care. This is just part of the high standard of service that we provide. Our team provides exceptional care to critically ill pets. All patients in our ICU are monitored continuously throughout their stay in hospital. Your pet will stay in a warm, comfortable, clean cage visible to our vets and nurses at all times. Our highly experienced veterinary staff thoroughly evaluate patients so they can inform pet owners on all their treatment options. We foster a friendly environment where open communication between our staff and you, the client, aids making the best decision for you and your pet. Our fully equipped 24 hour emergency centre ensures that our veterinarians and nurses are able to capably manage your individual situation while keeping the best interests of your pet in mind. We have all the latest equipment on site, ready to help care for your pet at a moments notice. Equipment includes body system monitors for blood pressure monitoring, ECG, pulse oximetry and capnography. Our clinic also utilises advanced intravenous fluid delivery systems, pristine surgical suites, digital X-ray, ultrasound and endoscopy equipment, comprehensive laboratory facilities and digital ventilators. Combining this equipment with our staffs expertise and experience, means your pet will receive care that is second to none. At BVECCS, we have the expertise and experience to diagnose and treat a vast range of medical conditions and ailments when you need to seek vet advice out of hours. BVECCS makes sure that we explore all treatment options, and thoroughly examine your pet to determine the cause of their problem or discomfort. If surgery is the direction we recommend, you can be confident that our vets and vet nurses are both experienced and skilled in the area of pet surgery. Our surgical areas are completely sterile to protect your pet’s health, and are equipped with state of the art machinery, monitors and more. Surgery for pets is similar to surgery for humans – the utmost care is taken with hygiene and procedure. Before, during and following surgery, our pet patients are closely monitored right through to the recovery period. Pain relief and comfort are our priorities for our patients. If your pet has had an accident, and requires surgical attention, you can rest assured that they will receive the highest standard of care and attention 24/7 at BVECCS, Emergency Vet Centre based on Brisbane’s north side.